When using songs, I like to play the song a few times before giving them a worksheet so that they get a sense and feel for the song. However, most of Maná’s songs are about 5 minutes, so there is often not a lot of time. After the students fill in the missing lyrics, and write down all the infinitives I have them look up the definitions of the verbs with a dictionary, a skill many of them need to work on. I guarantee many students will write down the definition for “sonar” instead of “soñar” which gives me an opportunity to reinforce that the “ñ” is a completely different letter. This year, I decided that I would do this activity on a half day of school. That does not give us a lot of time to look up the definitions and go over the song. So I decided to use Edmodo as a way to introduce the song to students. 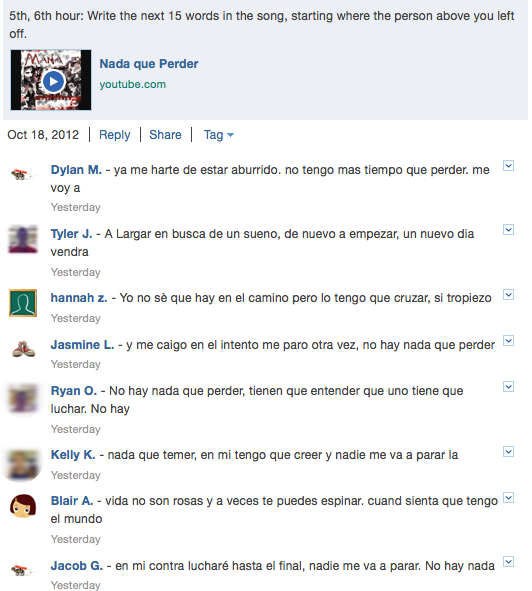 Here’s what they had to do:I posted a lyric video of the song on the class’s Edmodo page. Students had to write 15 words from the song in the comments section. The next student to reply had to continue where that person left off. In this way, the students will listen to the song, get practice spelling some words, and be familiar with the song so that come class time, we can just jump into the activity. We’ve attached our Nada que perder Mana Cloze Worksheet. Of course you can use any song that you can find a good lyric video for on Youtube. This entry was posted in Music, Web2.0 Technology and tagged edmodo. Bookmark the permalink.